ESN Society is happy to announce the third run of our most successful event, the International Dinner! As before, this will be an opportunity to socialise and enjoy some great food from all over the world. Feel free to stick around for drinks afterwards as well. • Cook a dish or dessert from your home country, or a country of your choice (cooking in pairs is also encouraged). Make sure to make enough to share around. • Enjoy the food from all over! If you do not bring along a dish, you are still more than welcome to come but will have to pay £4 for unlimited food! The last time we had some delicious food made by more than 60 people from all over, including Lebanon, Finland, China and France. We look forward to seeing what you can come up with! Check for facebook page for more info! To celebrate St Patrick's Day, the patron saint of Ireland, we will be taking part in another of our legendary Portswood pub crawls! Meeting at the Mitre at 8pm, we will promenade down to Clown's/Jester's by way of the Wild Lime and the Hobbit. Bring your friends, flatmates, +1s, the more the merrier. More info on the Facebook Page! Hello everyone! 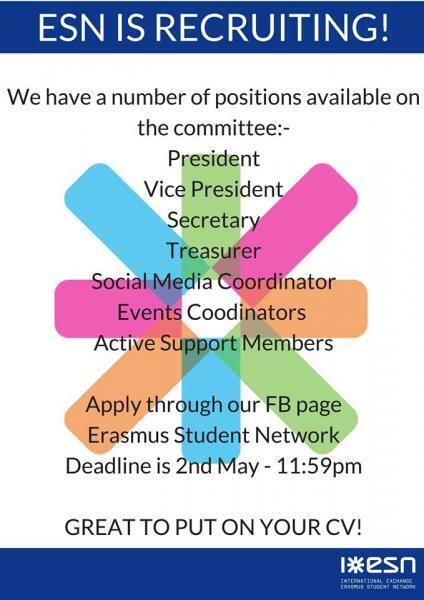 ESN Southampton is now recruiting for its 2018/19 Committee and you are all invited to apply! No experience is needed - we are looking for motivated and committed individuals, who are excited to get involved and become part of an international community here in Southampton! Full training and introduction to your role will be provided. 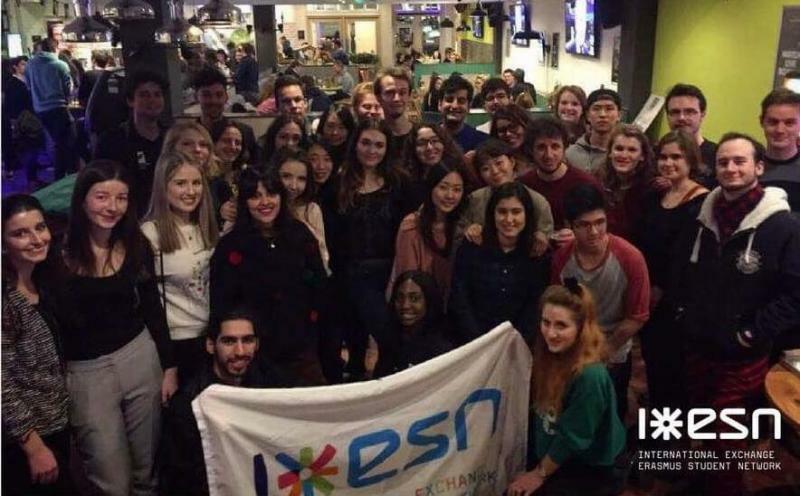 Throughout the year we organise several parties, day trips, cultural events, and a Buddy Scheme where we pair up native and international students We also implement several ESN international projects here at the University. By joining the committee, you will have the opportunity to go on fully funded international conferences and you will massively enhance your CV! The deadline for applications is Wednesday 2nd May at 23:59. Our AGM will be held on 9th May (Venue and times TBC) where you'll need to present your candidacy, but don't worry if you can't make it, you can send a video, presentation or have your application read out at the AGM. ESN is pleased to announce our Oxygen Freejumping event! This is an indoor activity centre with 150 interconnected trampolines, airbags, basketball courts, dodgeball courts and foam pits. It’s fun and great exercise! We have arranged to have a group of 20 visit for an hour’s session on Thursday 8th March at 8pm. We can increase this if more are interested, but this will be first come first serve and you will have to let us know you want to come by Sunday 4th March. It will be £10 each, payment will need to be in advance and we will post more on this shortly on the Facebook page. We will meet up at Highfield Interchange at 6:50pm and share transport as the park is a bit out of the way. Looking forward to it! Thank you to everyone who came to our International Dinner! We hope you all had a great time! Check out the picture on our Facebook page! Hello Erasmus and International Students! After 3 weeks of partying, speed dating and international cooking, ESN Southampton will be hosting a Movie Night on Avenue Campus! Please come to Lecture Theatre A (the room at the front of the building, not by reception) for 6.30pm where we will watch the most popular voted film. Entry to the event will be £1, where snacks and drinks will be provided for your viewing pleasure! The voting poll is on our Facebook page. Welcome back exchange students and hello new Erasmus and international family members ! New country, new city - new friends. 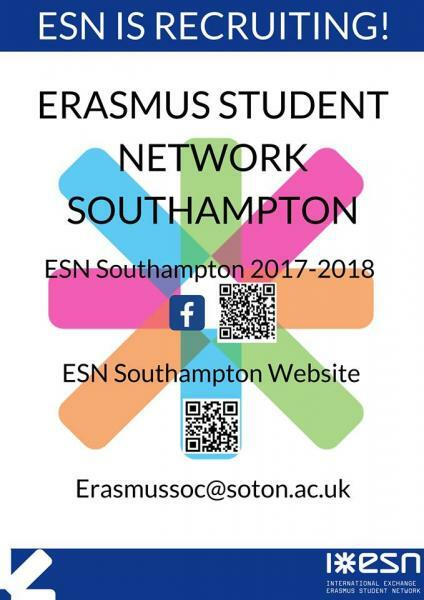 The Erasmus Society at Southampton is hosting a speed mating evening on Highfield Campus where we will be encouraging you to interact with your fellow exchange students. The event will be filled with icebreakers, activities and conversation starters. This is an opportunity to get to meet people from around the world! Some of us may be going out for food after so please feel free to join us. Please sign up on Eventbrite. This is a FREE event, however, TICKETS ARE LIMITED so if you are interested you must register for a ticket to confirm you are coming. If you like having fun - BE SURE TO COME! 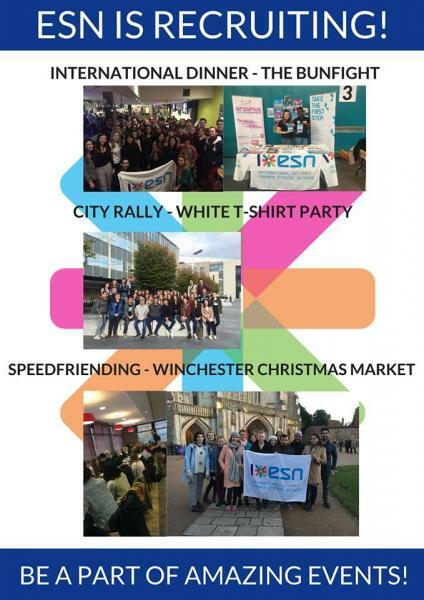 Come find the committee (look for the ESN flag) to purchase an ESN card (£10). The card gives you discounts on Ryanair flights, Economist subscription and eating establishments in Southampton. If you have any questions, let us know through the contact page, through Facebook or through our email esn@soton.ac.uk.